Mistakes I have made or discoveries that seem obvious after I have discovered them. 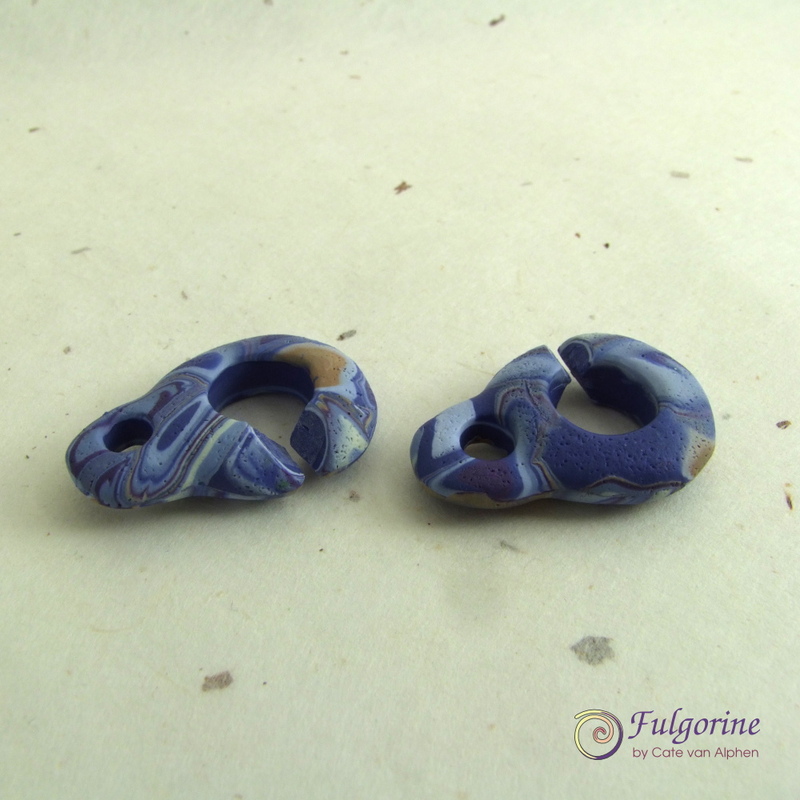 I was tempted to make more shank buttons this week for my indigo colour palette toggle, but then I realised time was running out for me to try some of the more interesting toggle mechanisms I’d planned at the beginning of the year. This clasp is formed from two hooks. By aligning the angular cut holes of the two pieces at 90°, they slide together to form a chain link. 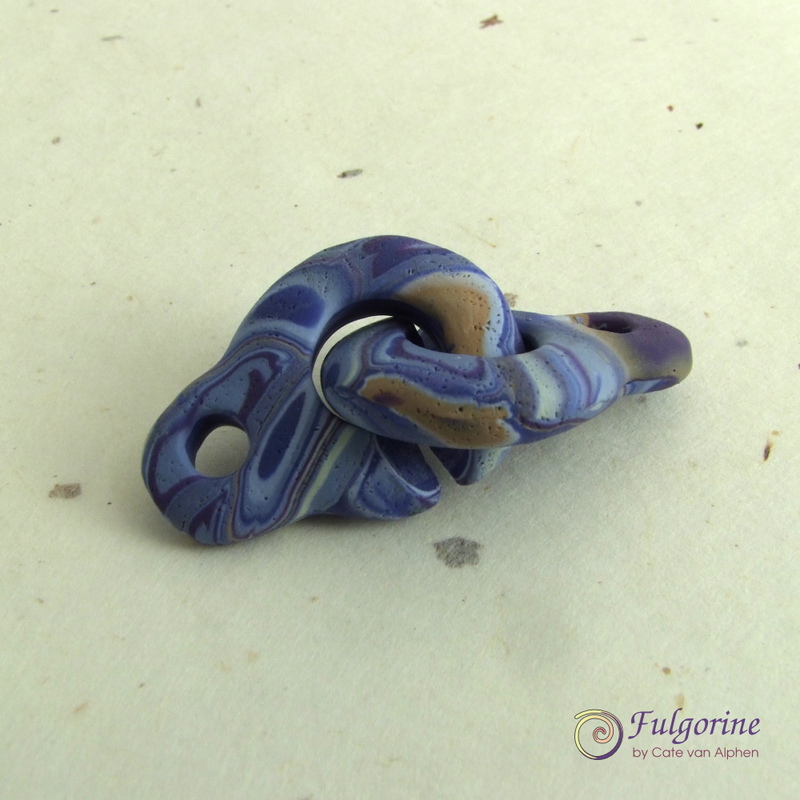 It’s very satisfying to open and close :D.
The clasp is based on one from a chunky wooden bead necklace that I found in a charity shop, but I’ve made mine from polymer clay instead of wood. It took a few prototypes to get this far, and it is still a work in progress. The first couple of clasps were a bit too flexible for my liking, but I didn’t really want to make everything a lot bigger and thicker. I put wire inside the third attempt as reinforcement, but you can just see it peeping through on the inside of the hole. From the photos above it looks like I’ve cracked it, but turn one of the hooks over and there’s wire sticking out. I lost track of which side had the gap in the wire for cutting the hole through, and I chose the wrong place. Doh! I’ve given the link a good pull apart and although the loops do flex open slightly (the one without the wire noticeably more so) I think a necklace made using the clasp would survive a tug from a toddler. So on the bright side cutting the wrong side helps to prove that the wire does provide some support, but also that I need to think of a way to keep track of where to cut ;). 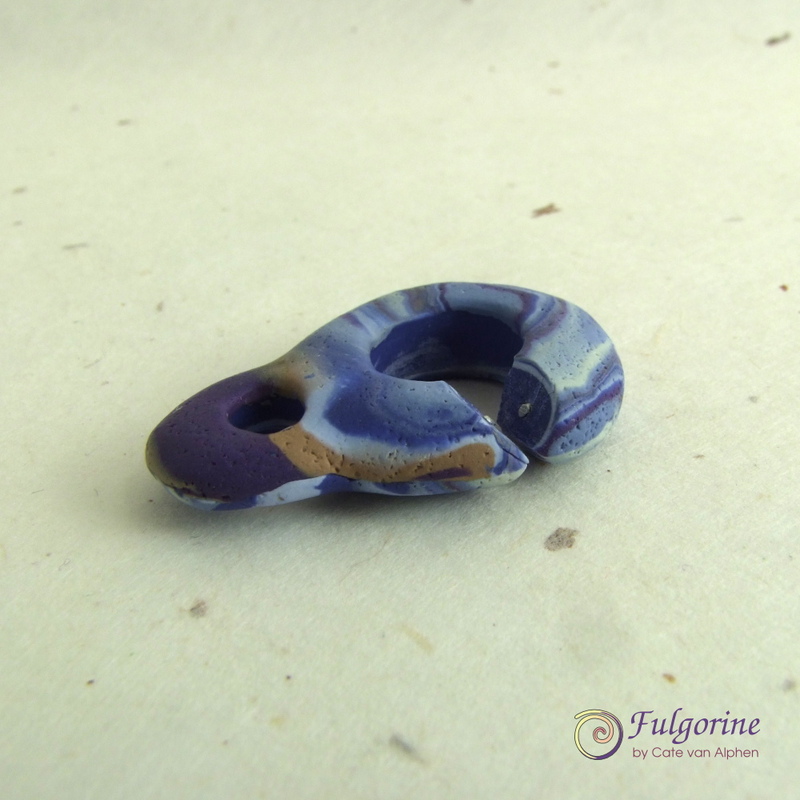 Posted by fulgorine in Doh! 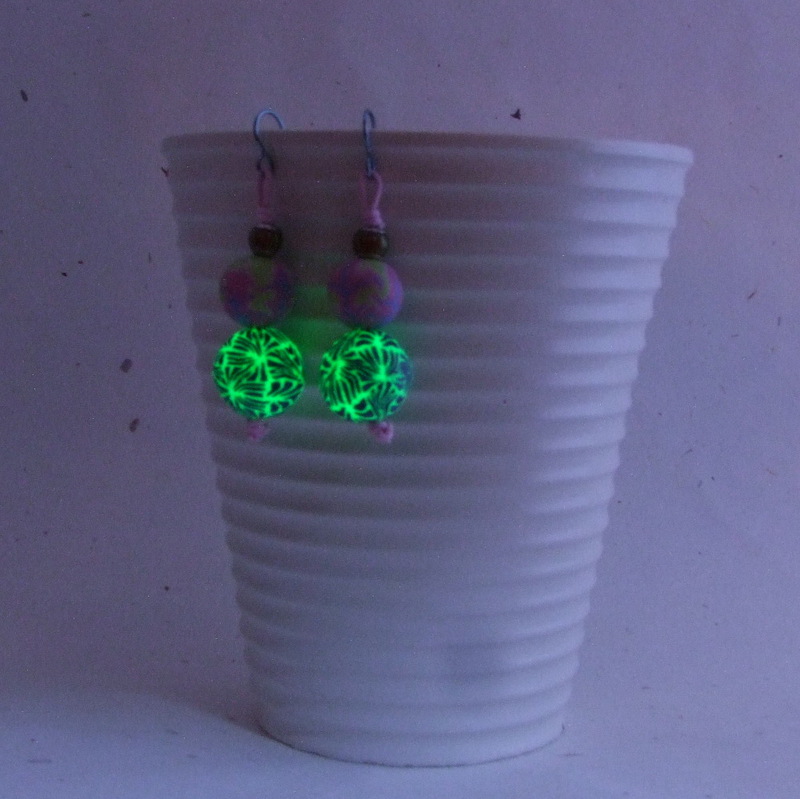 It was quite a struggle to take photos of my glow-in-the-dark earrings because I had to use the manual settings on my camera. Fumbling around in the dark is not the best time to try to figure out ISO and aperture. So after uploading my photos on Friday I did a bit of research. I have been doing more with the manual settings and I think I’ve seen a huge improvement in my photos! For some reason I had always thought that if the wibbly camera icon showed on the camera screen it meant there wasn’t enough light to take a decent photo. I knew higher ISO was for low lighting, so I’d up the ISO till the icon went away. It turns out this has the side effect of making the picture grainy. In the pictures above they have the same aperture, but the one on the left is ISO 400 and the one on the right (taken in worse light) is ISO 100. I think the second one looks cleaner. It wasn’t completely dark when I started taking the glow-in-the-dark pictures, and although it was too dark for me to see the background, at the slower shutter speeds the camera could. So it turns out that instead of increasing the ISO for lower light, I just needed to use a tripod and a slower shutter speed! Doh! 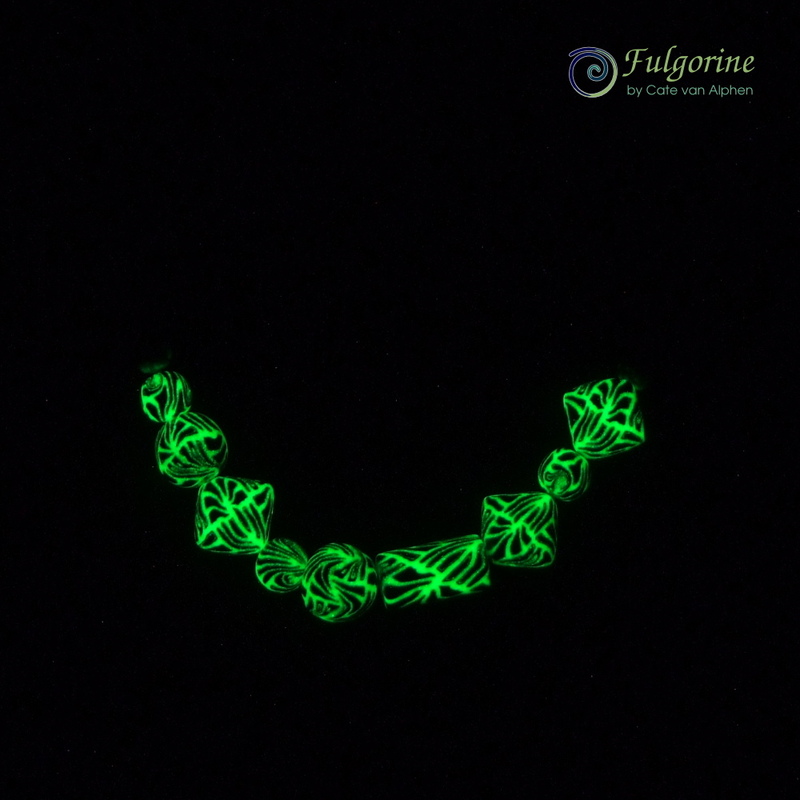 I took some new pictures of a necklace I made back in 2010 using beads made from the same glow-in-the-dark cane as the earrings. You can find this necklace in my Etsy shop. I thought it might make a nice companion for the earrings. I did notice a tiny crack after baking the back onto the dome which I thought was due to the air expanding inside the newly sealed dome. Therefore I drilled a vent hole via the threading holes. When I make pieces like this, which I bake several times, I usually to a partial bake for 10 minutes or so, and then a full bake at the end. I suspect the cracks are due to the partially baked clay waiting around for a few days before the full cure. So from now on I’ll be doing longer cures between and hopefully avoid the cracks. 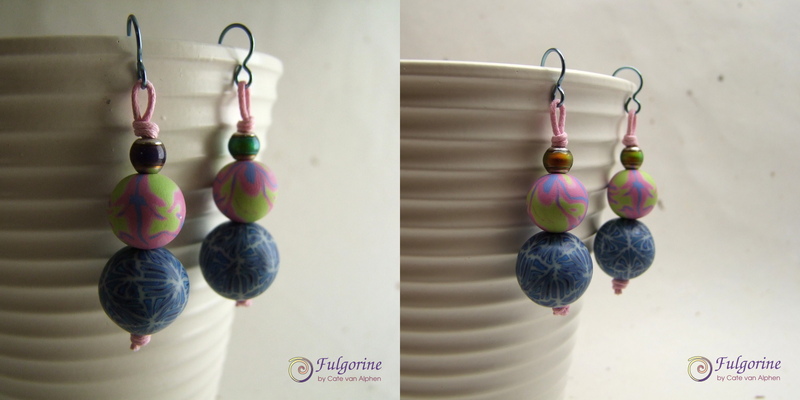 Almost as soon as I had made my polymer clay retro beads I was itching to swap the colours around. 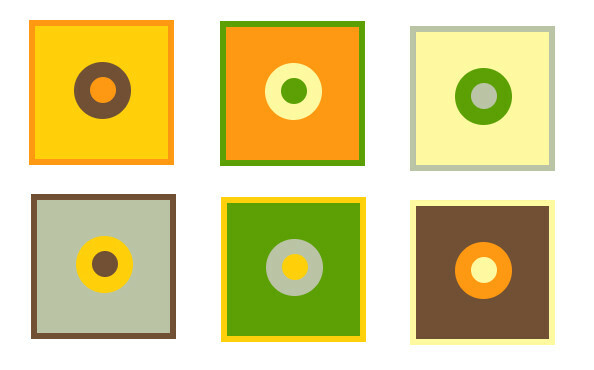 The combination I liked most was the one with the beige background and the big yellow and the small orange dot. It occurred to me that this was because it had a light, a middle and a dark colour. So I did a mockup on the computer to check this in black and white. See how heavy and dark the green and brown together become when it’s in black and white? Here’s an alternative colour scheme. I’ve gotten rid of the repeating combinations e.g. big brown dot with small green dot on one tile and big green dot with a small brown dot on another. 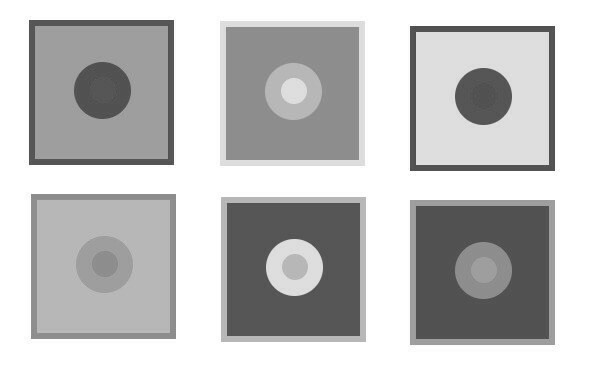 And see how the pattern still pops even in black and white? I’m not sure how many different colour combinations there are, but it’s a pretty deep rabbit hole as artists such as Josef Albers have discovered before me. 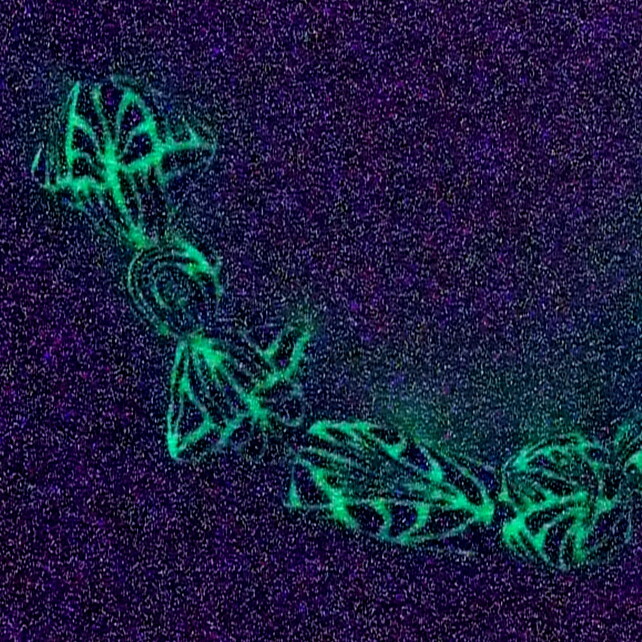 Will I be remaking these beads? Probably not (or at least not anytime soon since it’s nearly time for green). Although I think I’ve learnt a few lessons that will help if I do decide to make these in the next colour scheme. Lesson 1: do a mockup on the computer before spending a day making beads! 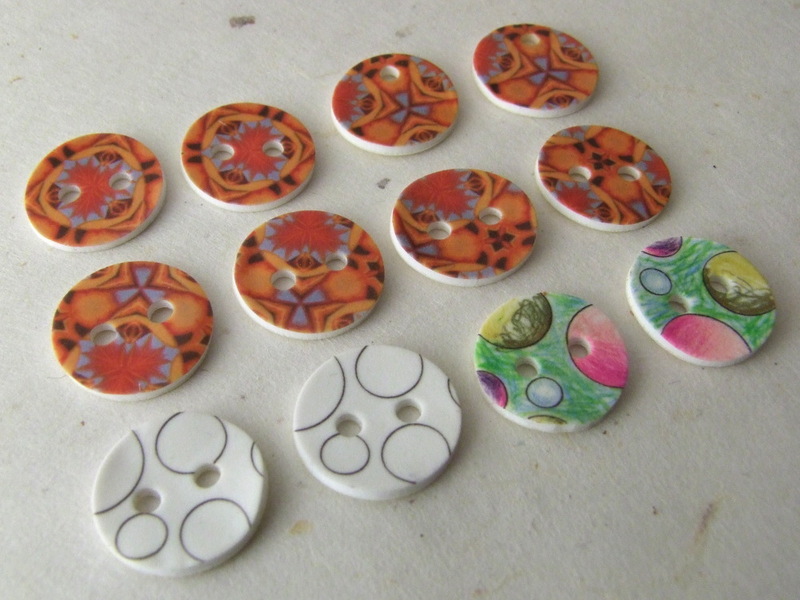 As I was making my polymer clay buttons, I thought I should test how they cope with being washed. 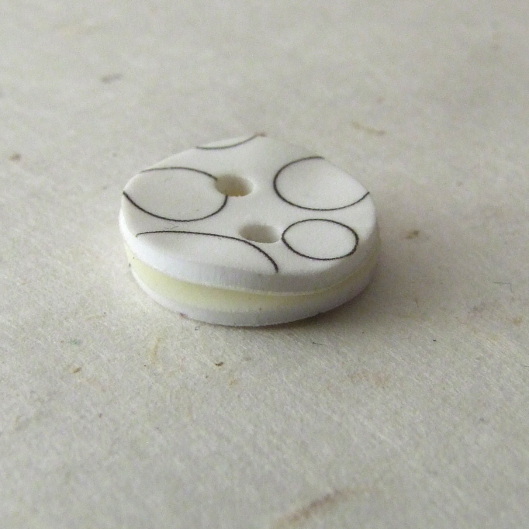 From my research on the internet, polymer clay buttons hold up fine but I do like to check these things myself. I also remembered that a while back I got the materials to make buttons using shrink plastic, so I decided it would be good to test those at the same time. Since the first batch of buttons I made is packed away, I made some new ones. 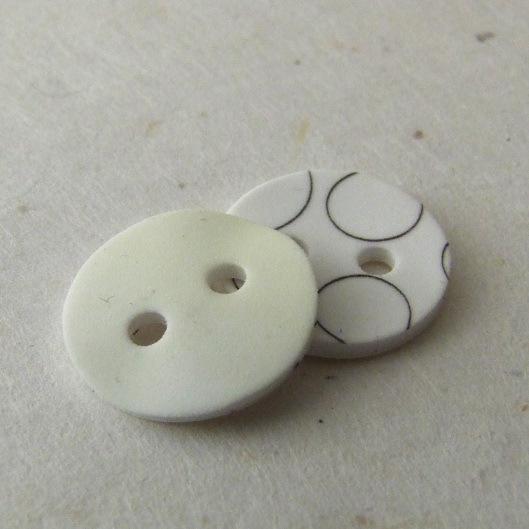 My shrink plastic is printable, so I made a variety of buttons to test different surfaces. I still need to test washing the buttons, but there are already a number of things I don’t like about the shrink plastic. 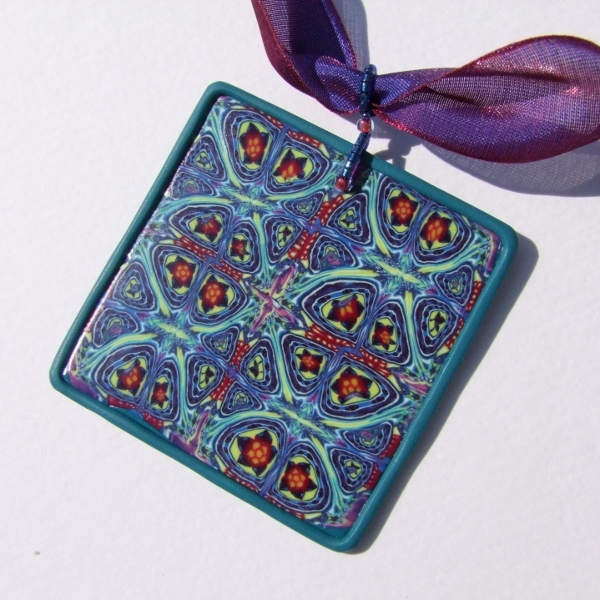 The first kind is 100% colour printed, using a pattern derived from my kaleidoscope cane. It was easy to make perfectly aligned kaleidoscope designs using the computer, but the colours are disappointing. The colours get darker (which I accounted for) but they also change when the plastic shrinks. I’ve pictured them next to a polymer clay button for comparison. Somehow the shrink plastic has lost vitality. 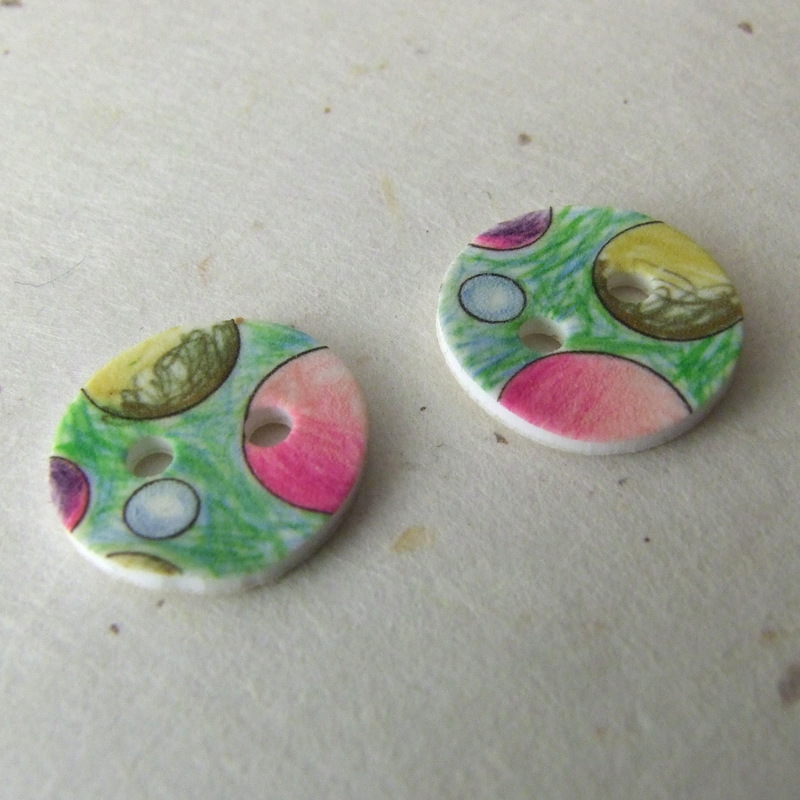 I made the next buttons by printing out black lines and colouring them with coloured pencil. Generally I like the colours but the ugly khaki colour in the yellow circles was originally orange pencil which mutated when the plastic shrank. And does one button have a wonky shape? Yes indeed! I used a punch to cut out the shapes so they started off evenly sized and perfectly round. The backs are slightly discoloured yellow. Perhaps the tile they were on burnt them? I was using my heat gun on the front of the button so I’m a bit confused. Too hot? Too close? Just something that happens? I’m not particularly keen on the white edges of the buttons either. Maybe I’m just too fussy. Oh well, we’ll see what the washing machine makes of them. 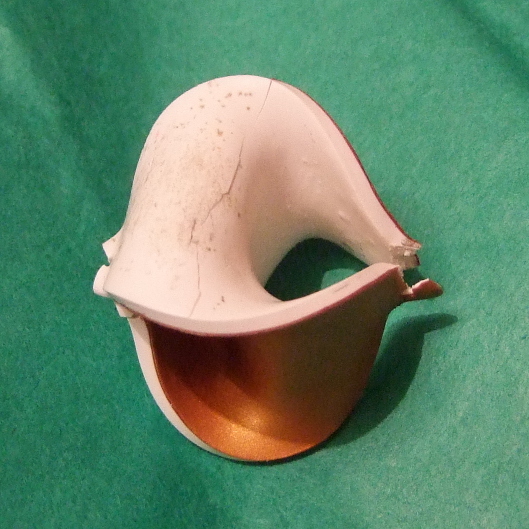 When I did my demo for making a Christmas ornament, as I made a mobius shape, instead of stretching, the clay tore (I think because it was cold). 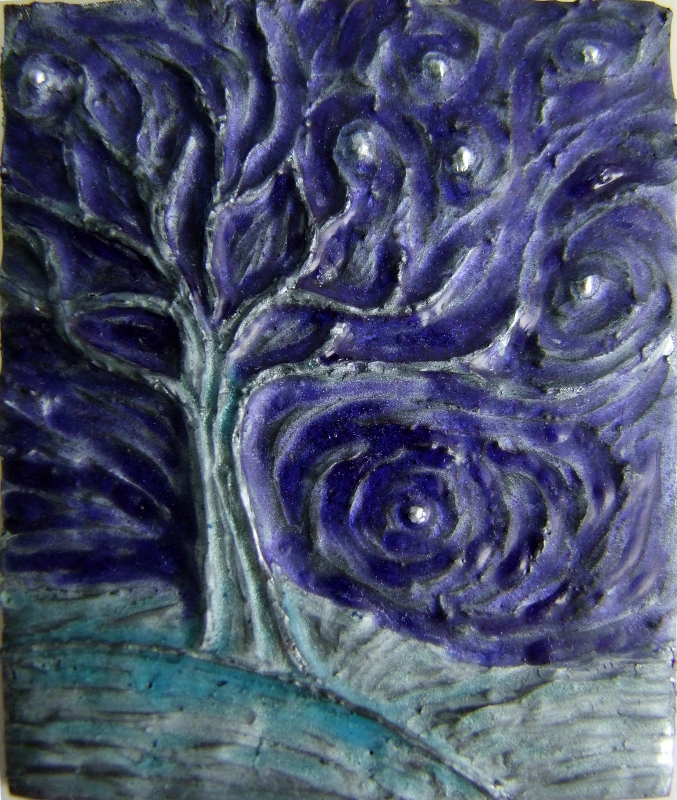 So I quickly made up a plain white and gold version using white Kato clay instead of Fimo Classic which I usually use. When I got home I baked the ornament on some polyester batting on a tile in my oven (just as I had done for the others). Sadly it distorted under its own weight and the tip popped open. Since I never leave a man behind, I thought I would see if I could remedy some of the disaster. 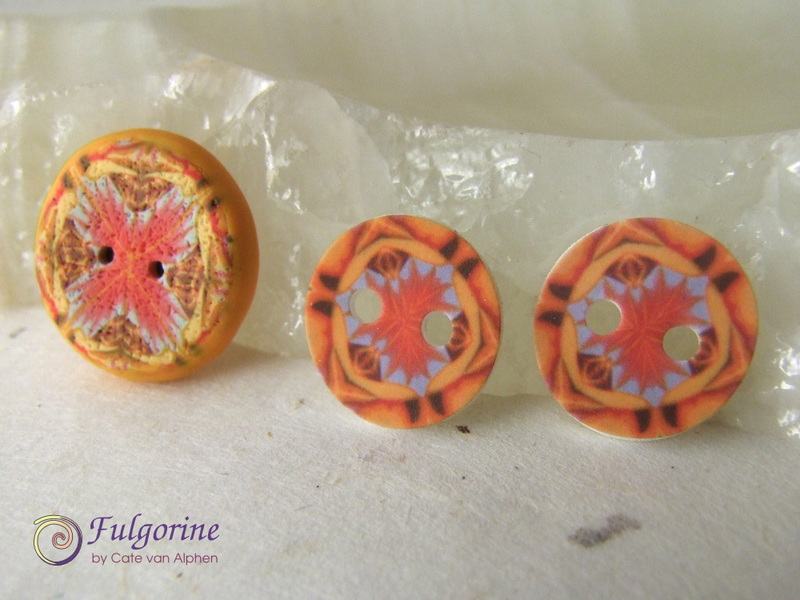 First I drilled through the tip so I could squeeze the pieces together and wire it up (I had needed to do this with some of my Fimo ornaments too – I must remember to add a drop of liquid clay!). First the sides cracked, then the tip shattered as I twisted the wire together! 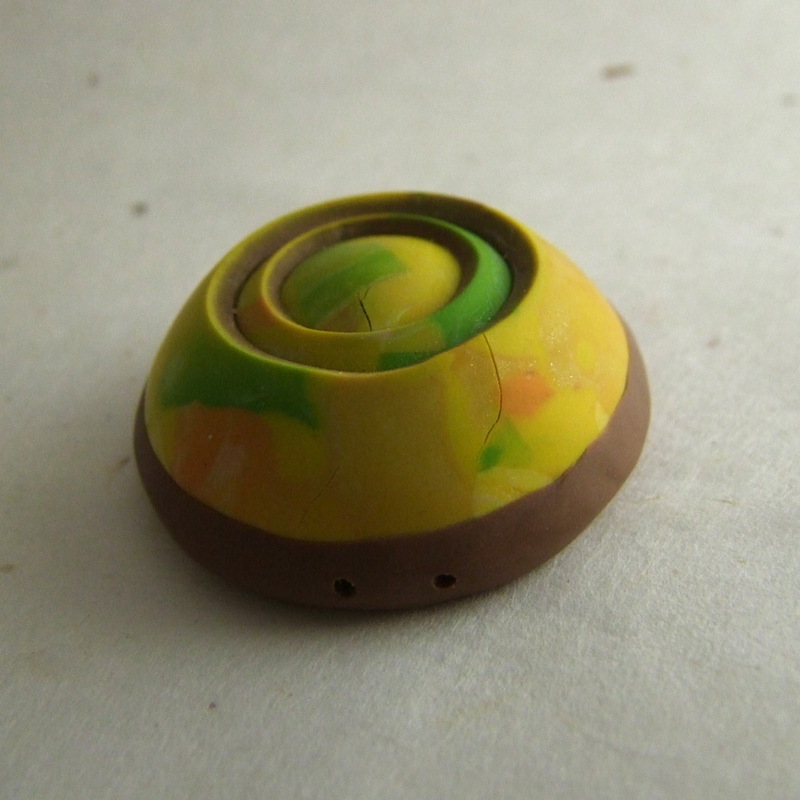 To be fair I hadn’t cured the Kato clay at its full temperature since the gold clay was Fimo which is not supposed to go above 130° C.
I wasn’t quite ready to give up yet, so I suspended the ornament on a bead pin over a small glass and cured it again. My idea was to see if the weight of the ornament would pull the shape out when the clay got hot again. 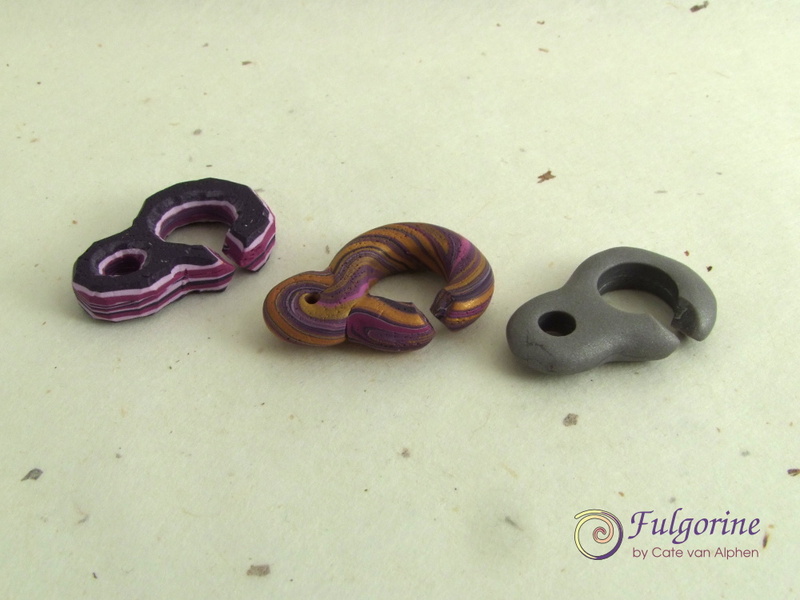 I thought I’d see how the Fimo ornament coped with being cured on a pin, so I dug out the square of uncured clay I had used in the demo (the one that had torn). I healed up the tears using my magic parchment paper and piece of card (the same method I use to smooth a surface sheet). Sure enough this one also tore through, so the ornament ended up getting cured at the bottom of the glass (and didn’t squish). I cut off the torn point and drilled perpendicular so I could add a wire loop. The other tip also opened up with this one but I was able to wire it together without causing cracks and I added a bead dangle. 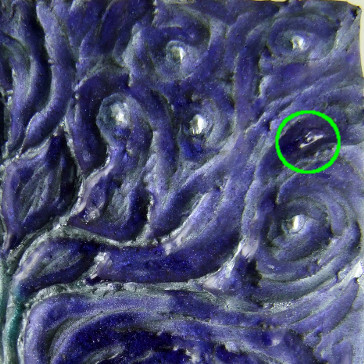 There is a small scar visible in the metallic clay, but overall I’d say this one survived. I wondered if a cardboard egg box would make a good support to cure these ornaments? Otherwise I’m afraid my advice is: stick to Fimo Classic clay. 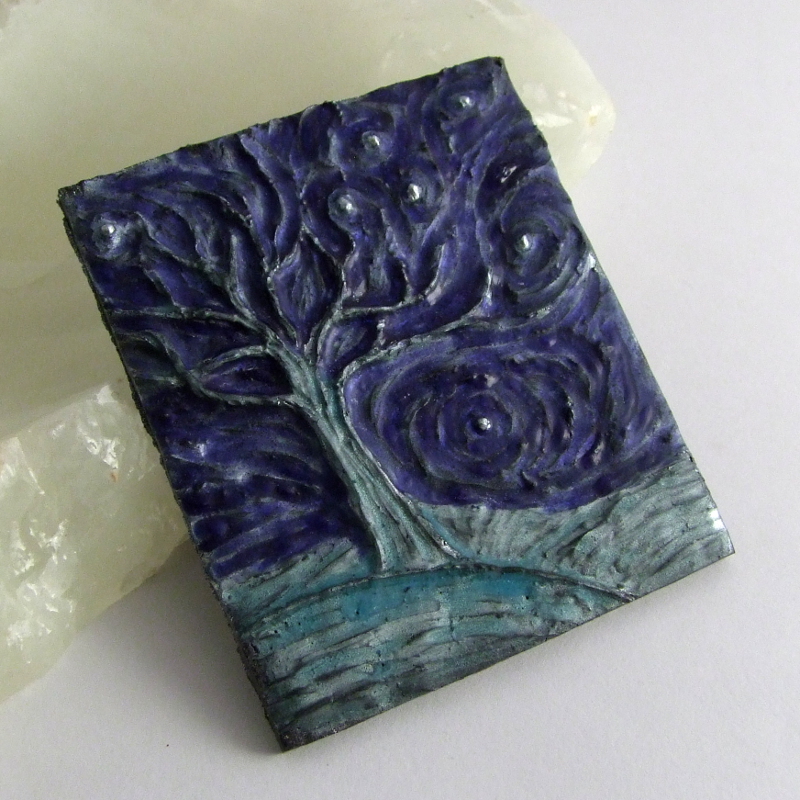 I haven’t been able to keep up with my blog reading recently, but last night I realised it was a new month (yes it took me 6 days) so I headed over to the Art Beads Scene blog to see the new challenge and… Surprise! 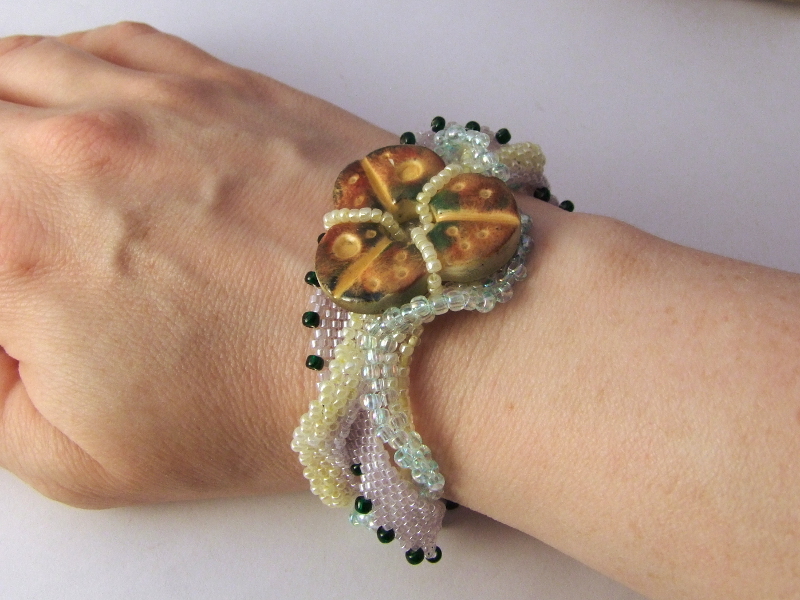 There was my bracelet as one of the randomly selected winners for June. 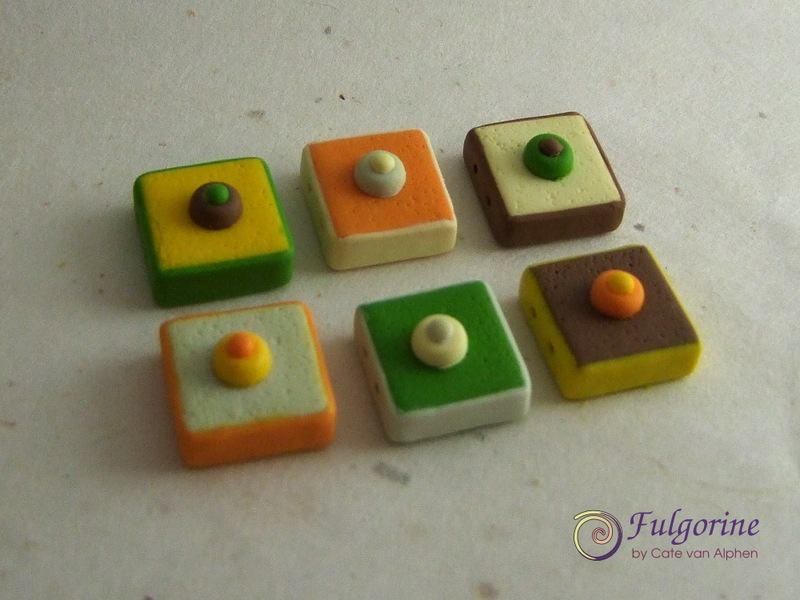 I’ve just been invited to a new Flickr group, Your No.1, sharing the first things we made in polymer clay. I thought I’d show them here too. 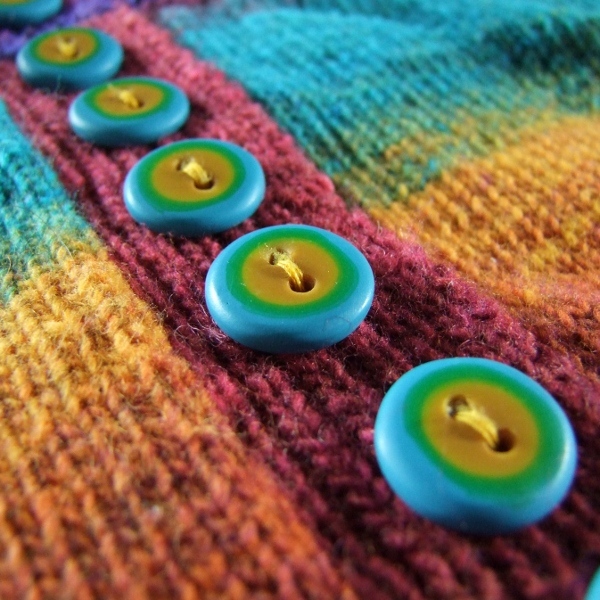 I started off fairly reasonably with something simple – buttons to match a multicoloured cardigan I was knitting. Success! I managed to get the colours matching pretty well and they are not too mutant either (I did make a mold off an existing button to get them all consistent). Then I got more ambitious and decided to make a complex kaleidoscope cane… less successfully. The main error with this cane was that I didn’t cut the ends off after reducing. I added scrap to the ends which got sucked into the centre of the flower cane as it reduced so when I cut it to make the kaleidoscope repeat I ended up using bad cane throughout. (Also note the poor photo taken in direct sunlight). This detail image shows more clearly the problem. 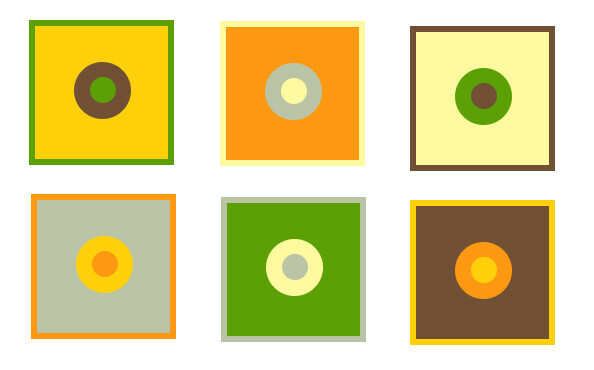 There are supposed to be two flower canes surrounded by concentric circles mirrored along the yellow diagonal. The lower flower has a blob of scrap obscuring half of it and the top one has almost completely disappeared and is mysteriously much smaller. I do like the colours in this one so perhaps I should see if I can make something similar again. Hopefully my skills have improved a bit since 2009.